Ole Gunnar Solskjaer won his first game in permanent charge of Manchester United, although Watford will count themselves unlucky not to have come away from Old Trafford with at least a point after dominating for large periods. United played mostly on the counter-attack, and took the lead approaching the half-hour mark when Luke Shaw played a superb ball in for Marcus Rashford to score his tenth league goal of the season. 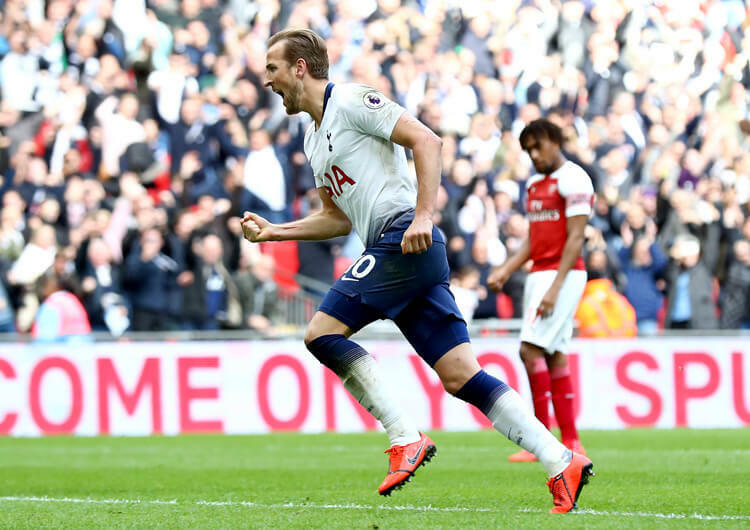 The hosts struggled to get a grip on the game, however, and were fortunate to extend their lead when Anthony Martial bundled in a second midway through the second half. Despite their possession, Watford failed to create the quality of chance they needed to strike back; Abdoulaye Doucoure’s late goal wasn’t enough for them to leave with anything, as they now look forward to an FA Cup semi final against Wolves. Victory for United, meanwhile, edges them closer to a Champions League place. Ole Gunnar Solskjaer set Manchester United up in a 4-3-1-2 formation, with Paul Pogba, Nemanja Matic and Ander Herrera as the three deeper central midfielders. 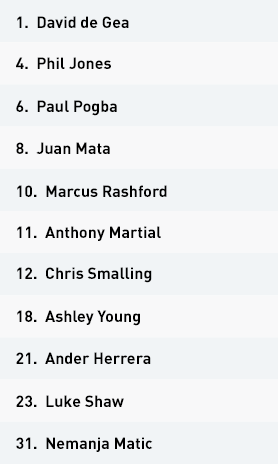 Juan Mata operated just behind Anthony Martial and Marcus Rashford, who started as a front two. The hosts operated mostly on the counter-attack during the first half, with Rashford tending to stay high out of possession and United looking to play forward and in behind to him as early as possible. Pogba was particularly effective in this respect, although it was a pass from left-back Luke Shaw that found Rashford on the counter for United’s first goal. Rashford and Martial tended to operate out wide rather than occupying the centre. 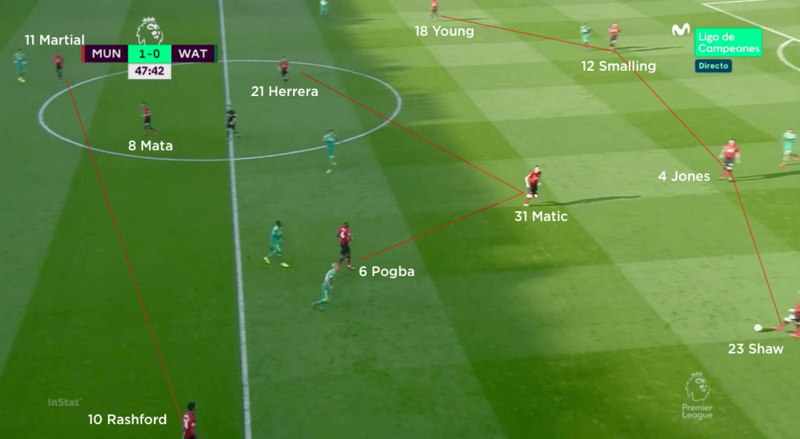 This allowed for runs from deeper positions from Mata, although Herrera also looked to provide penetrative support while Pogba mostly remained behind the ball and in deeper areas alongside Matic. With Watford adopting an attacking approach, United looked most effective in transitional moments and tried to be direct with their play. Their first thought was usually to play and run forward, with limited circulation of the ball to try and find gaps to play through. Out of possession, United operated in more of a 4-3-3. Mata positioned himself between Rashford and Martial on the top line, while Pogba, Herrera and Matic formed the second line. The midfield trio stayed compact in the central area, in order to pick up the inside movements of Will Hughes and Roberto Pereyra, but also to deal with second balls if Watford chose to play direct to Troy Deeney. Rashford and Martial both positioned themselves between full-back and centre-back, with Mata in between. 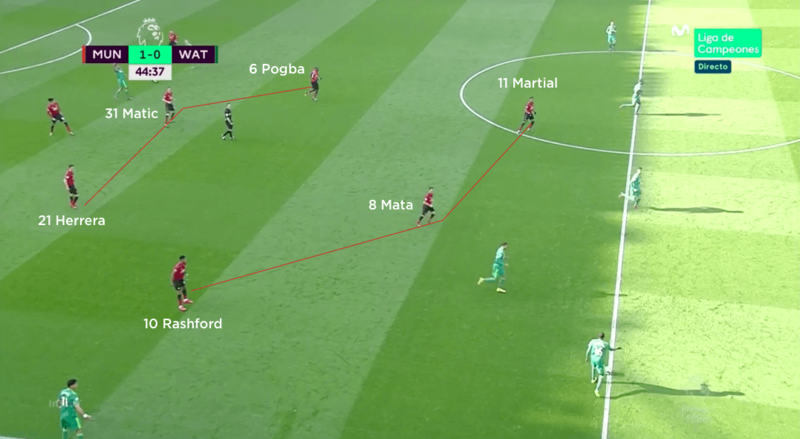 If Watford played into one of their central midfielders, then Mata and the attacker on that side would apply pressure from two angles to force the man on the ball to execute more quickly. 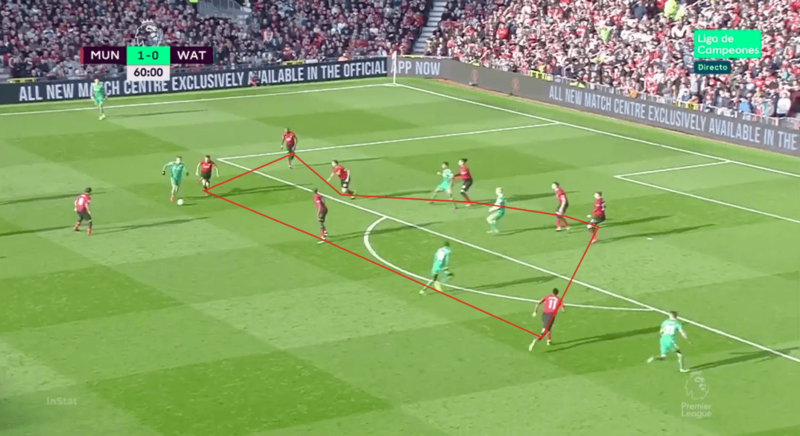 When United defended deeper, the line of engagement would be the halfway line. The pressing trigger was then the ball into one of Watford’s full-backs, which would elicit the press from Rashford or Martial. Nearer to their goal, the hosts tried to crowd the penalty box and prevent shooting lines to goal; they tried to show Watford inside because of the number of bodies they had protecting the area, and as a result were able to block several of Watford’s many shots on goal. Despite them having significantly fewer shots during the 90 minutes, this was central to them coming out on top, however narrowly. Manchester United set up in a 4-3-1-2 formation, with Juan Mata operating behind a front two of Marcus Rashford and Anthony Martial, both of whom tended to operate in wide areas. The hosts dropped into a 4-3-3 out of possession. Mata joined the two forwards, who mostly positioned themselves between centre-back and full-backs, on the top line. Despite being at home, United played mostly on the counter-attack. They left Rashford high up the pitch and looked to play in behind for him as soon as possible. Watford set up in a 4-2-2-2 formation in possession. Troy Deeney and Gerard Deulofeu led the line, with Will Hughes and Roberto Pereyra sitting behind them in central positions, rather than from wide. The Hornets dropped into a more regular 4-4-2 shape out of possession, with Hughes and Pereyra dropping alongside Etienne Capoue and Abdoulaye Doucoure in a four-man midfield. Deeney and in this case Deulofeu would often drop from the top line to receive on the blindside of the United midfielders. This gave them time to receive and turn on the ball. 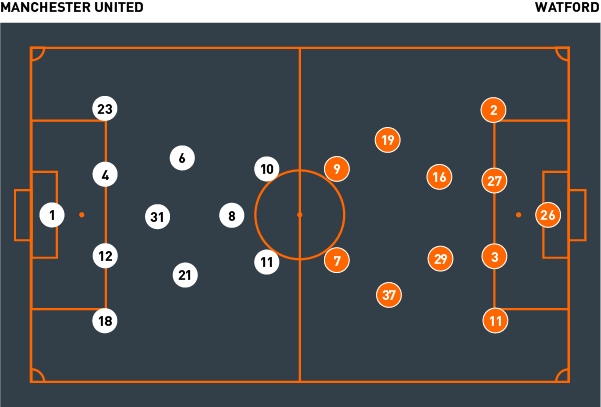 The visitors were effective at bringing the ball up to the edge of the United box, but consistently struggled to create clear chances against a wall of United bodies in front of the goal. Watford set up in a 4-2-2-2 formation in possession, with Etienne Capoue and Abdoulaye Doucore as the deepest central midfielders. Will Hughes and Roberto Pereyra made up the next attacking line, with Troy Deeney and Gerard Deulofeu leading the front line. The visitors were fluid in attack and tried to move the ball quickly, with several blindside runs going beyond United’s lines to receive. Deulofeu and Deeney could also be seen dropping off the top line on the blindside of United’s midfield three, from where they could receive and turn. 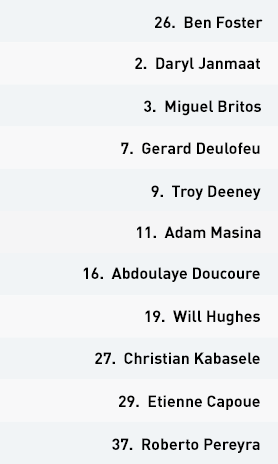 Pereyra and Hughes operated more like two number 10s than wide midfielders. 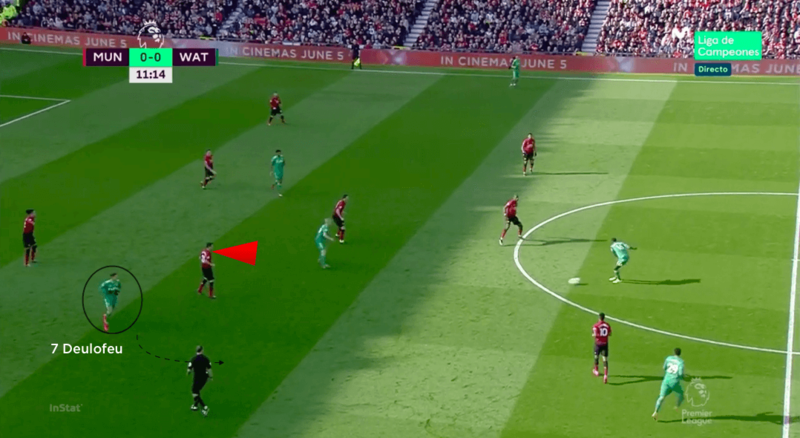 This allowed full-backs Daryl Janmaat and Adam Masina to provide attacking width, although the former did this much more than the latter, perhaps due to the threat of Rashford on the break. Watford were effective at bringing possession up to the edge of the box through rotation in midfield. Once they reached the edge of the box, they lacked the sufficient quality to create clear opportunities, with either the final pass or the receiving player often lacking the detail in their execution to take advantage of the limited openings that United afforded them. This ultimately cost them a better result, with Doucoure scoring their only goal as the clock ticked towards full time. In transition, Watford looked to play Deulofeu in behind early. 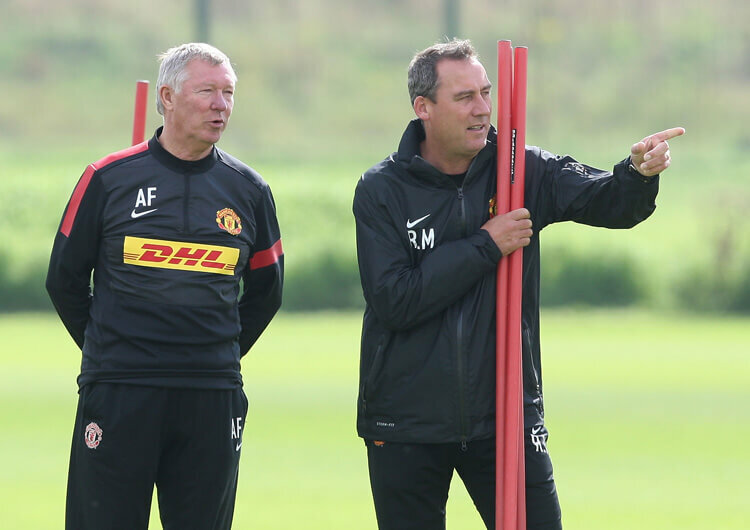 However, the Spaniard had a tendency to take a lot of touches; this often slowed down the counter-attack, allowing United to get players back into shape. Out of possession, Watford looked to press United in their half. Deulofeu and Deeney led the press by looking to shut down Chris Smalling, Phil Jones and even David de Gea if the ball moved back to him. Pereyra and Huges locked on to full-backs Ashley Young and Luke Shaw, while Capoue and Doucoure looked to affect the two nearest central midfielders. 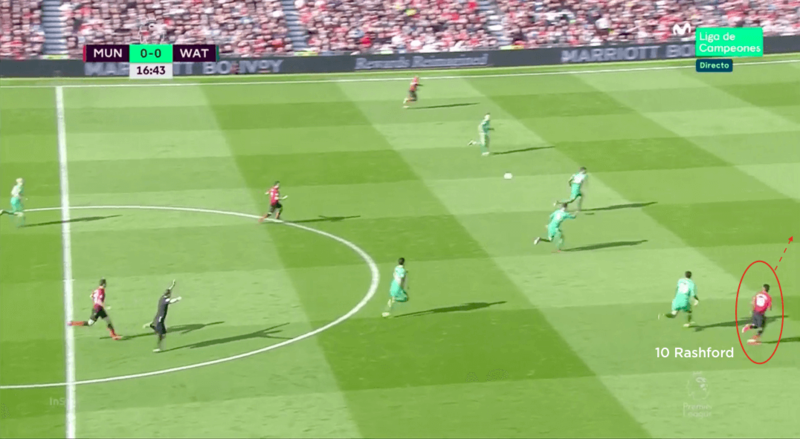 This high pressing forced United into longer, aerial passes that Watford were adept at dealing with, often resulting in regains on the second ball. 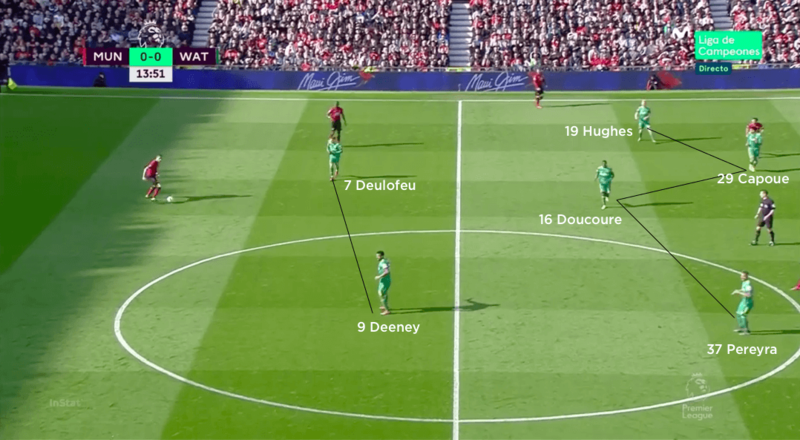 If Watford chose not to press United high, then they would retreat into a 4-4-2 mid-block, with Hughes and Pereyra falling either side of Doucoure and Capoue to make the midfield line of four behind Deeney and Deulofeu. In transition, the visitors tried to operate a counter-press immediately upon losing possession; this would be initiated by the nearest man to the ball, but would rarely involve more than two Watford players moving towards the ball. 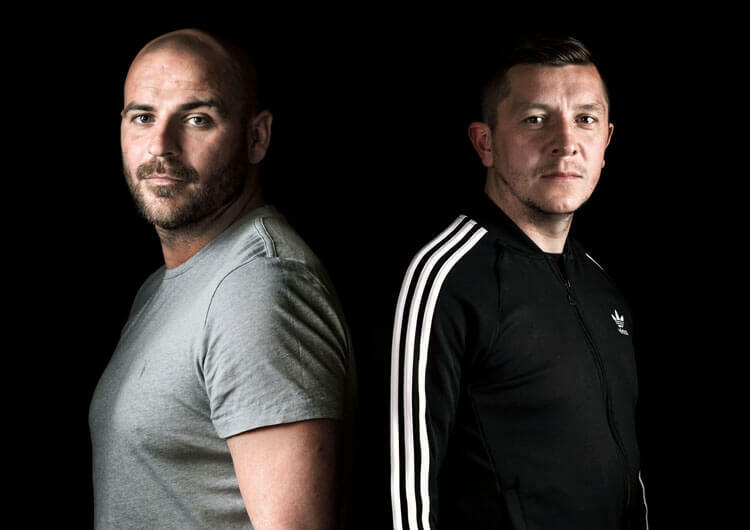 The counter-press would continue in this fashion until either possession had been regained or United managed to move the ball into an area of good possession where the distance was too large to the new nearest man to continue the press.